The format for the Burchfield Open will be 2 rounds of 18. One round on Rivers Edge and one round on Renegades Trail. 50/50, Ace pool, CTPS, added cash to all divisions! Since we are playing both long baskets on holes 11 and 15 there will painted OB will between the fairways so any shots thrown onto the other fairway will be out of bounds and played from where the disc crosses the rope with a 1 stroke penalty. On River's Edge MA2, MA3, MA4 and all Female divisions may be playing from short pads. 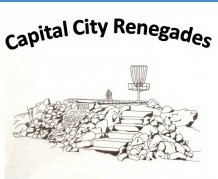 The layout for this tournament will be used for this year's CCR OPEN!! So come on out and get some rounds in! Lunch will be provided for players between rounds free of charge.